Gleneagles Hospital Kuala Lumpur is a leading international tertiary care providing hospital, established in 1996, and accredited and awarded by national as well as international organizations. The 370-bedded hospital has high-tech infrastructure with modern technology based facilities, making it one of the advanced healthcare service provides in Malaysia. The hospital offers high standard of quality clinical care, maintained by highly trained medical staff including support staff and a multi-disciplinary team of accomplished doctors backed by training from reputed institution. 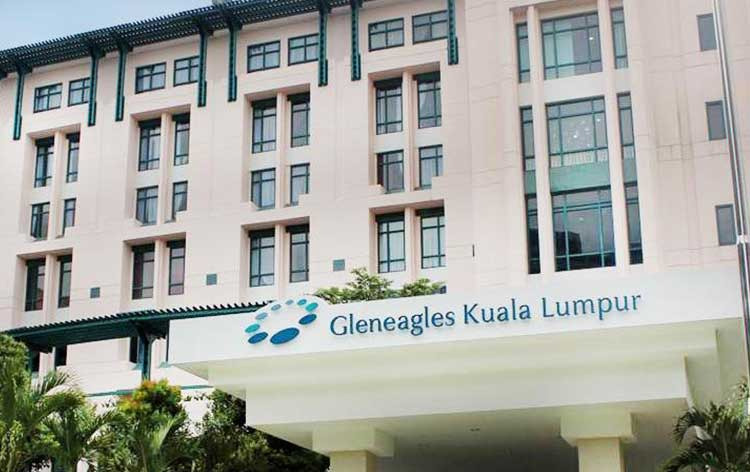 Gleneagles Kuala Lumpur is a part of Pantai Medical Centre Sdn Bhd, a renowned brand in healthcare industry, and the hospital is also involved in social welfare work with an aim to benefit the community. Diagnostics and Imaging unit comprises of high-tech machines including 3 Teslar MRI, 128-Slice CT Scanner, Digital Mammography. Cardiac Department at this hospital has STEMI programme which caters immediate attention to patients with acute myocardial infraction, and also has a round the clock operational Catheterization laboratory. The hospital has Leksell Gamma Knife® Perfexion™ which is an advanced Gamma Knife technology, enabling the treatment of a wide range of tumours with its precise radiation delivery with superior accuracy to the target only, thereby minimizing the risk of unnecessary exposure. The hospital also possess da Vinci Surgical System, a robotic technology for minimally invasive surgery which allows surgeons to perform complex procedures with utmost accuracy. Gleneagles Kuala Lumpur is a world-class medical facility offering a basic to complex healthcare services to domestic as well as international patients. The hospital is a renowned centre housing advanced technology and reputed specialists delivering exceptional clinical care and medical treatment, making it a preferred choice of destination for medical tourism. International Referral Office at the hospital has a dedicated team to ensure the comfort and personalized care of the patients from abroad. Nearest Airport: Kuala Lumpur International Airport is 60 km away from the hospital and takes approximately 1 hour to reach via road. Nearest Metro Station: K L Sentral Railway Station is just 13.4 km away from the hospital and takes approximately 15 min to reach via road. Nearest Metro Station: Dato' Keramat LRT station is just 1.8 km away from the hospital and takes approximately 4 min to reach via road. Gleneagles Hospital Kuala Lumpur performs 193 different procedures. Click on a procedure name to see more details and to view doctors for that specialty. 4.5 average based on 54 reviews.